Our dynamics of providing human resources is coordinated with needs of business. If you are interested for possibility for employment in company Eurotek, please fill the candidate form of employment. 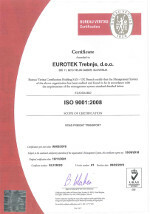 I allow, that Eurotek d.o.o., collects, keeps, process and uses all my personal informations which I gave in my registration into their database for employment candidates.